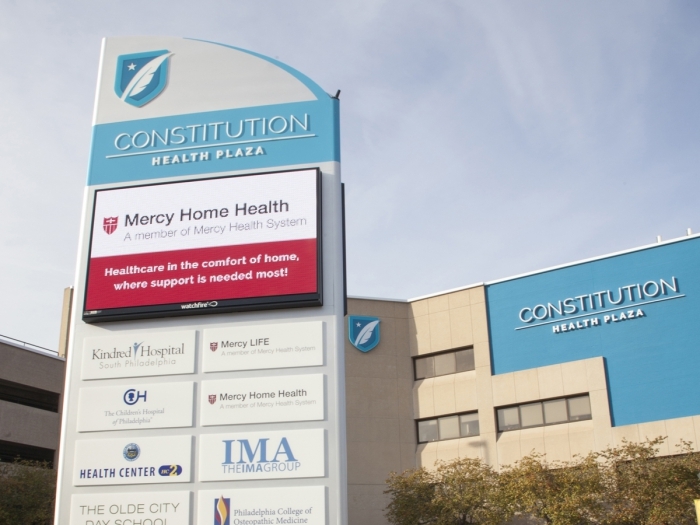 Constitution Health Plaza (CHP), located in an historic Philadelphia neighborhood, put the finishing touches on their renovation of the former St. Agnes Hospital with the installation of a new digital sign designed to serve as a landmark for this busy city neighborhood. The 30-foot tall, stand-alone monument situated on the corner of Broad Street and Passyunk Avenue is visible to both road and pedestrian traffic. It defines the hospital’s location while unifying the building’s tenants under one brand. CHP in South Philadelphia serves as a multipurpose medical campus and center for community care. Established in 1920, the campus has been extensively renovated into a multipurpose medical facility that now serves a population of over 1.5 million.